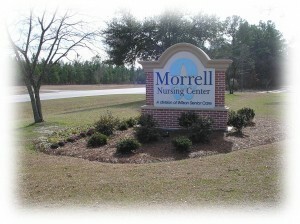 Morrell Nursing & Rehab Center isn’t what you’d expect. It’s much, much more. Located on 10 wooded acres on the north side of Hartsville, S.C., Morrell Nursing & Rehab Center has been a family-owned and run nursing center for more than 20 years. It was founded by Henry McCuen Morrell, Sr. in memory of his parents, Luke and Lizzie Morrell. In 1996 it was purchased by Darlington-native Dr. John Wilson and his family. Now operating under the auspices of Wilson Senior Care, Morrell Nursing & Rehab Center is a 154-bed short- and long-term facility with 24-hour care from medical directors and skilled nurses. Morrell also offers the benefits of individualized and managed care programs, licensed social workers and dietary professionals. Morrell’s philosophy of care is to maintain and enhance the quality of life of each resident, and it focuses on the resident’s right to privacy and lifestyle of freedom within the individual’s range of mental and physical capabilities. They accomplish this through activity programs, on-site beauty parlors, community dining rooms and more. Designed to reflect home life, Morrell offers an atmosphere of comfort and privacy. A spacious dining room provides residents and their families with a quiet place to relax and socialize. And recent renovations include three new suites – amenities include weekly flowers, in-room cable and telephone, special menus and guest meals.